I first came here towards the end of long bike ride on a beautiful day in May 2000. I'd left remote and delightful Flowton, buoyed up by its springtime perfection. I headed on to Burstall down a narrow lane that was marked on my map, despite that village being signposted in another direction. I soon found out why cars were not encouraged to reach Burstall this way. The pretty lane steepened, the banks rose, and trees made a tunnel of green light as my bike flashed beneath them. A sharp bend, and in front of me there was a sudden ford, the water like crystal in the sharp sunlight. Regular users of this site may remember my difficulties with a ford at Sapiston. But, in general, I love them, and this one was a delight. I put up my feet, and cut a 20mph swathe through it. I came out into fields, the lane widening slightly. New-born lambs fled in horror at the whirr of my wheels, seeking out their mothers in the flock. I came to another ford, crossing the lane at an angle, and then I was climbing up again, meeting the main road into Burstall. It had been an exhilarating couple of miles, and I was tempted to go back and do it all over again. After Flowton, Burstall seemed rather suburban - mind you, after Flowton, anywhere does. 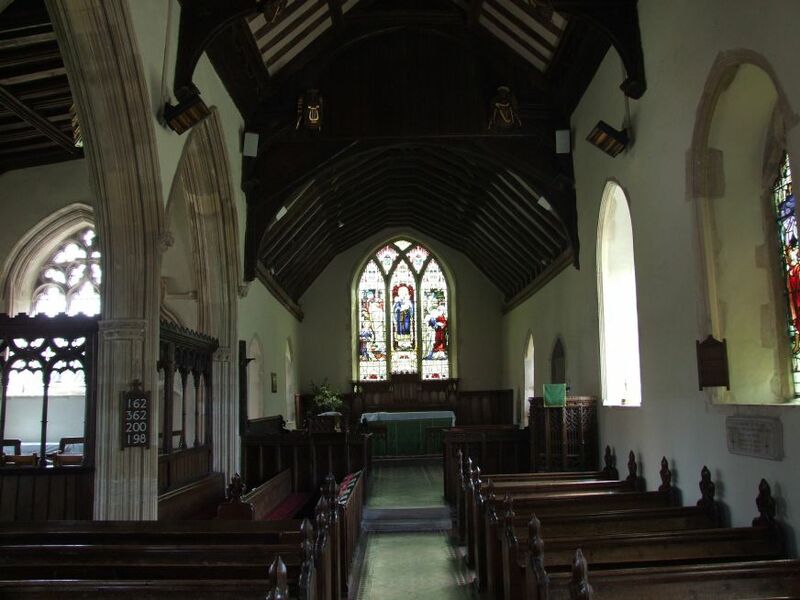 But this is not really fair; Burstall has some lovely houses, a gorgeous Arts and Crafts Metrolandesque village hall, and the church is a grand sight in the village centre, a fine north aisle fronting the road. 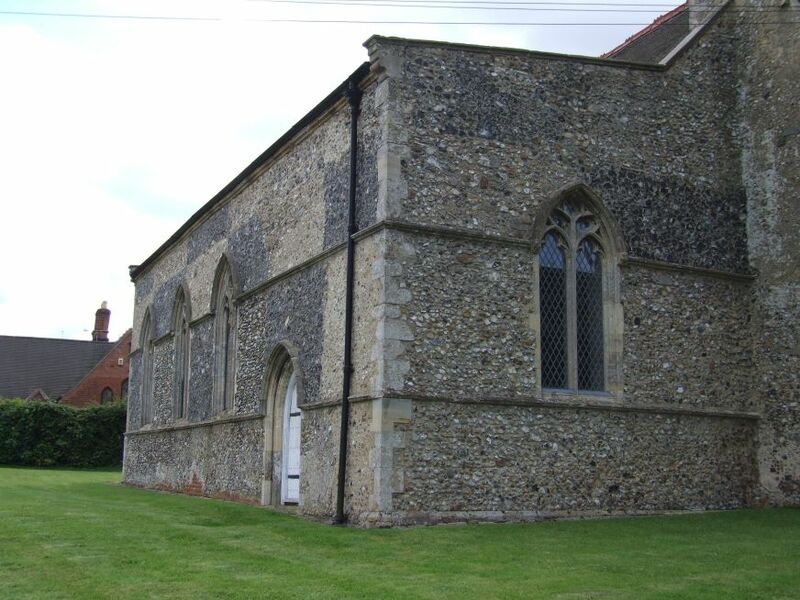 Externally, St Mary is all pretty much of a 14th century piece, and as the Decorated tracery of the windows is relatively unfamilar in Suffolk, it is something to savour. The north side is gorgeous. The south side is rather more what we are used to, and if the churchyard feels a little trim, it also has a sense of being a well-loved, much-used place. 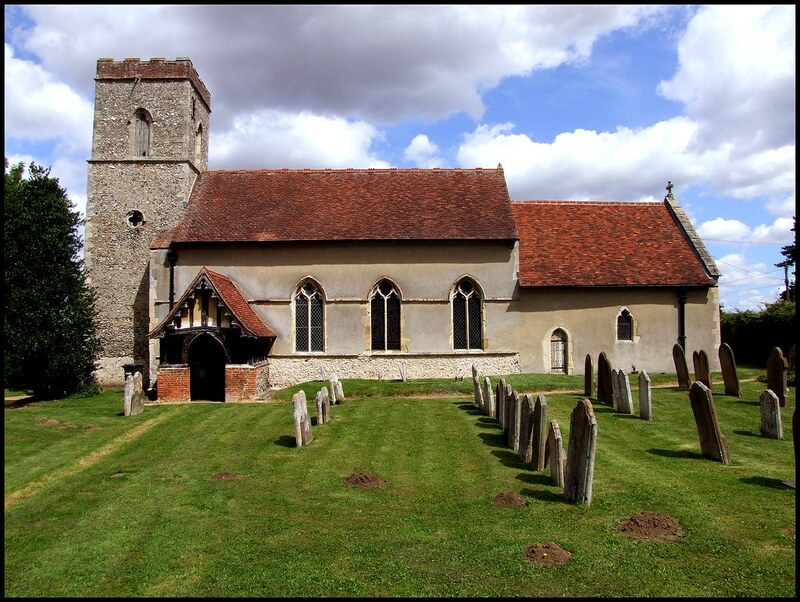 One particularly interesting item is a stone laid by descendants of the local Wilkins family, who emigrated to Australia. 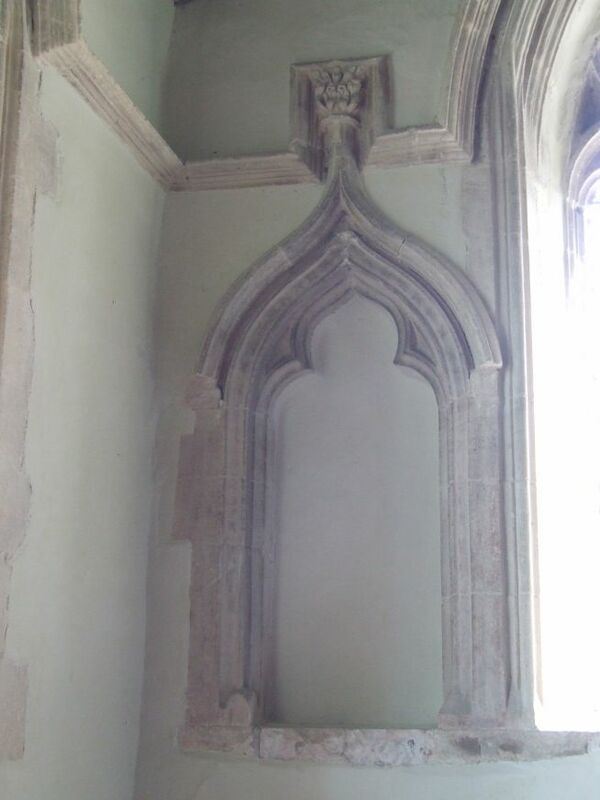 The west side of the tower has a curious alcove. Was it a window? A niche for a statue? A Victorian conceit? I stepped inside to dim coolness, a crisp Victorianisation with a glorious vision of the Middle Ages beyond. This is the arcade that separates off the north aisle. 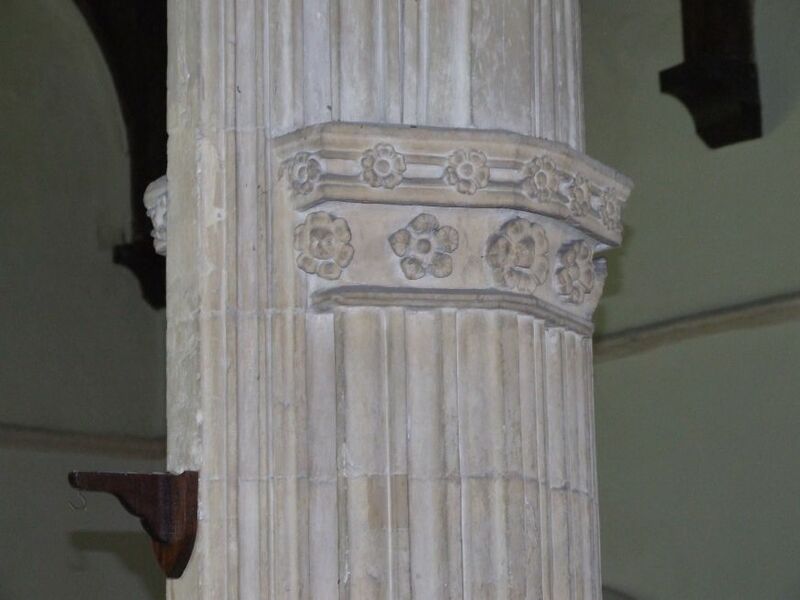 It has intricately carved capitals with fleurons and paterae, and heads that look down on either side. On such a small scale, it is wholly delightful. 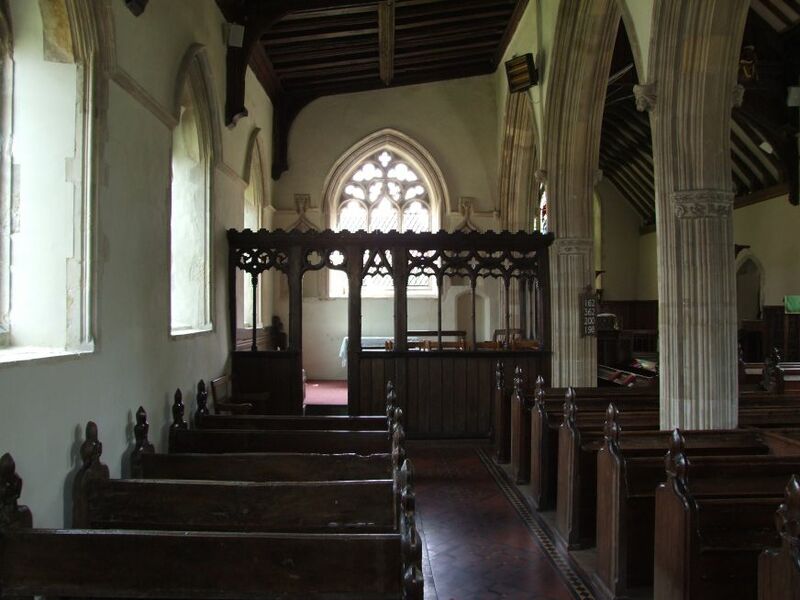 The aisle itself is full of contemporary pews, some of the earliest in Suffolk, and to sit down in one is to recapture, an experience of our ancestors. 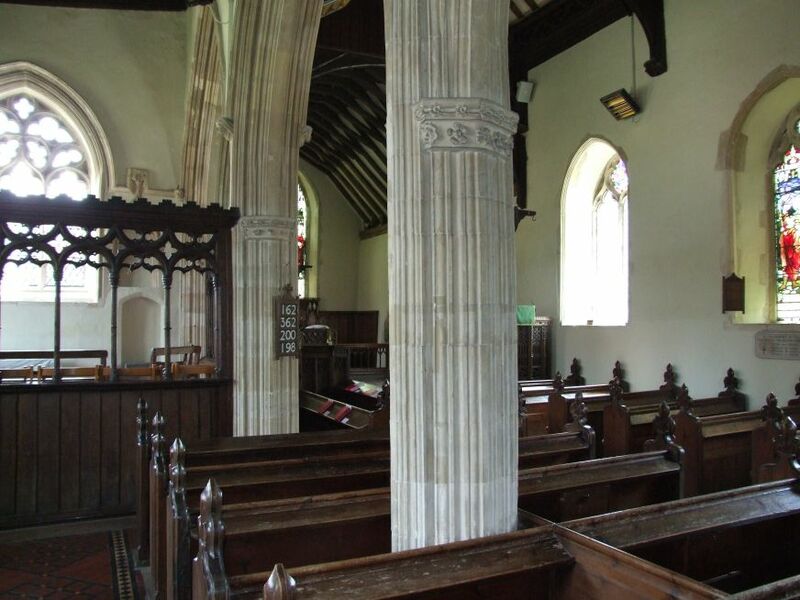 At the end of the aisle is a parclose screen, which once contained a chantry altar. After the Reformation, it became the family pew and mausoleum of the puritan Cages. Today, it is a pretty side chapel. The screen is a fine piece of work, robust and imposing. It was probably worked locally. 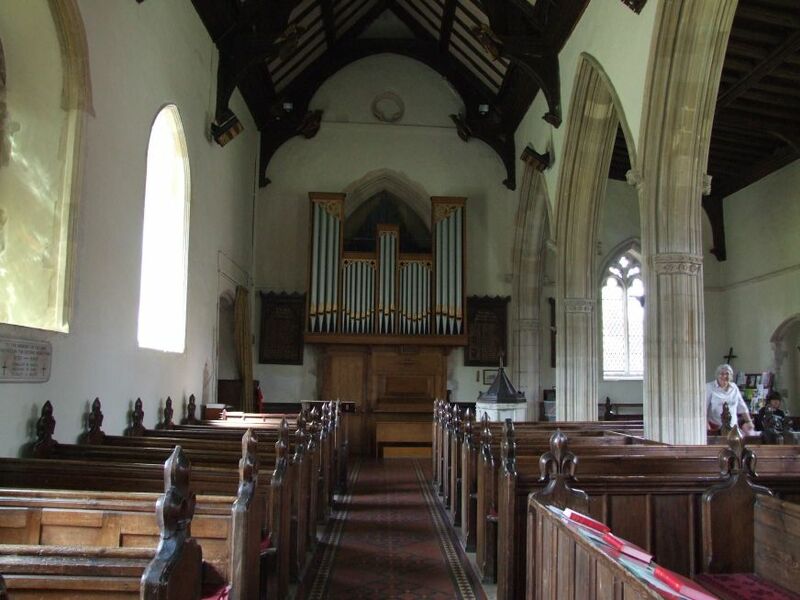 I loved the way that, although it must have originally been painted, it now lends an organic quality to the north aisle that is quite missing from the otherwise excellent Victorian nave and chancel. 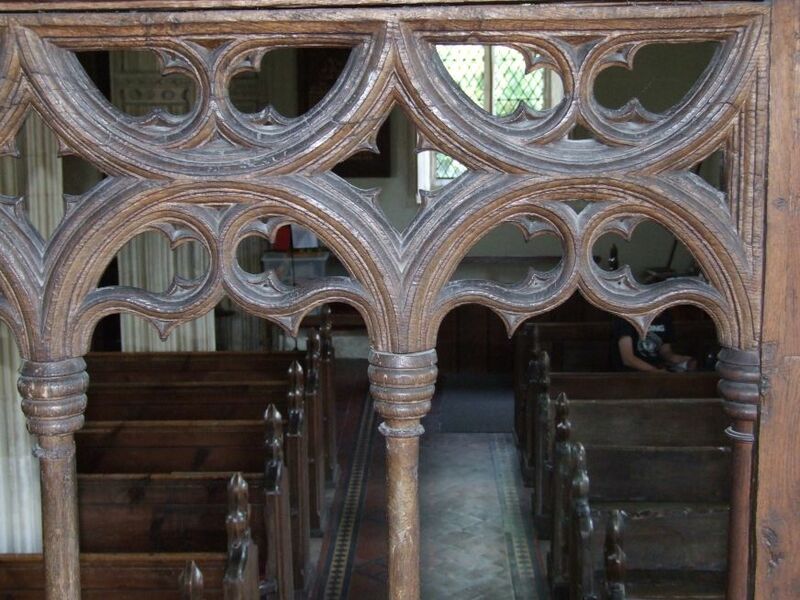 An extraordinary thing in another way is the surviving roodscreen dado. This doesn't amount to much, admittedly, and I realise that this site is a little prone to criticism of Munro Cautley's furnishings, but it does seem a bit crass for him to have fixed a reading desk onto the top of it.Perhaps he was trying to recapture the mood of a college chapel, and in the late 19th century and early 20th centuries, this church was famous for its choir. I counted seating for about thirty members, and a memorial on the north wall of the chancel is for a precentor of the choir at the turn of the century. This is a relic of a bygone age, for robed church choirs are a passion that has been and gone - or one that is going, at least. Their genesis in the Oxford Movement revival of the 1850s and 1860s tied them to a ritualistic style of liturgy that is increasingly out of fashion. This has happened quite suddenly; when I was a child in the 1970s, on a tough housing estate in north east Cambridge, it was still cool to belong to the choir of the local Anglo-catholic church. There were 20 boys and 15 men (all male voices, of course!) and we sang four times a week.We had the best choir football team in the Ely Diocese. Hard to imagine now. I stood between the choir stalls, and, for a moment, a vision of myself at eight years old, in cassock, surplice and ruff, came back to me. Just for a moment. Robed church choirs really took off after the invention of the Festival of Nine Lessons and Carols at Kings College Chapel just before the First World War. This was also a time when the use of candles in even the lowest churches was increasing, and the whole music and atmosphere thing was an integral part of the relocation of CofE worship as part of national identity. No wonder that, for much of the twentieth century, ordinary non-churchgoers considered themselves 'CofE'. No longer. There has been a dramatic and often perceptible shift in the role of the Church of England, and of the nature of the Anglican liturgy, over the last twenty years - indeed, a shift in the Church of England's own understanding of what it is, and what its being the Body of Christ means today. Things have not settled down, and Anglicanism still feels like a denomination in search of self-comprehension. The jury is still out. 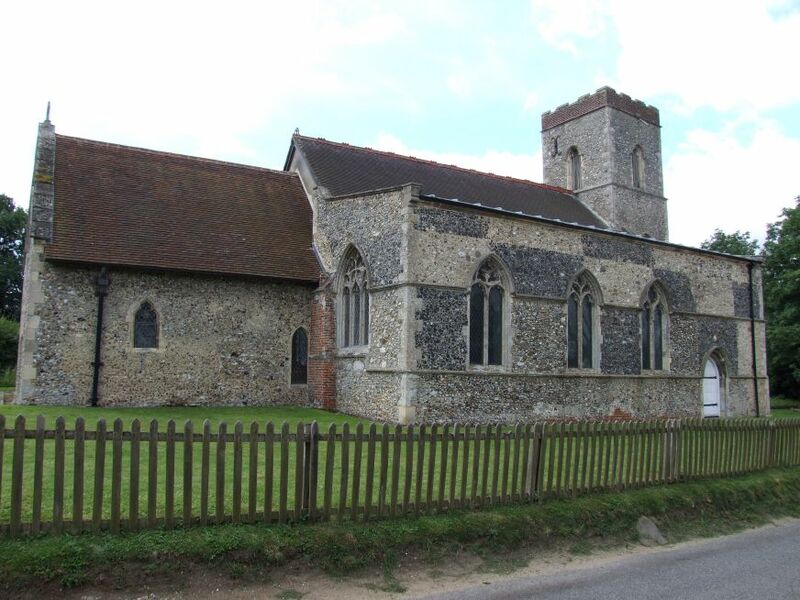 St Mary's restoration was in the 1870s, under the guidance of William Barnes. 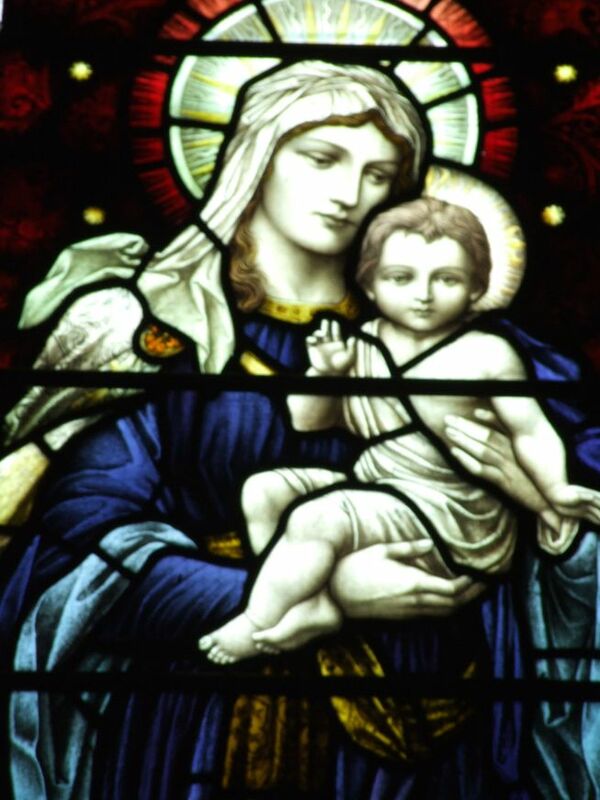 There is a gorgeous, and wholly Catholic, Madonna and child in the east window. Mortlock thought it was by by Heaton Butler and Bayne. 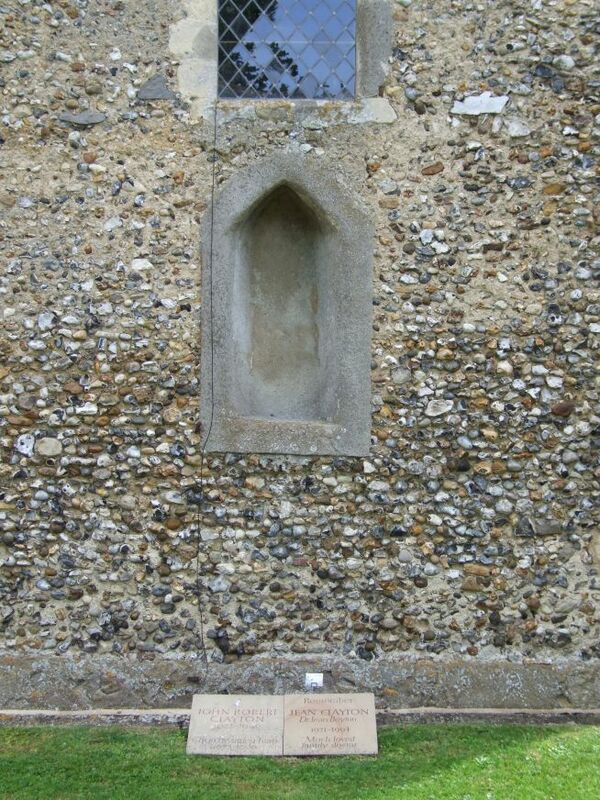 If you are looking for the First World War memorial, it is is, unusually, a window in the south wall, with the names beneath it. Back in 2000, I had left my copy of Mortlock's guide behind, lying on a pew. The lovely churchwarden found it, and returned it to me. Coming back in 2007, it was a complete coincidence that I met her in the church, and was able to thank her. 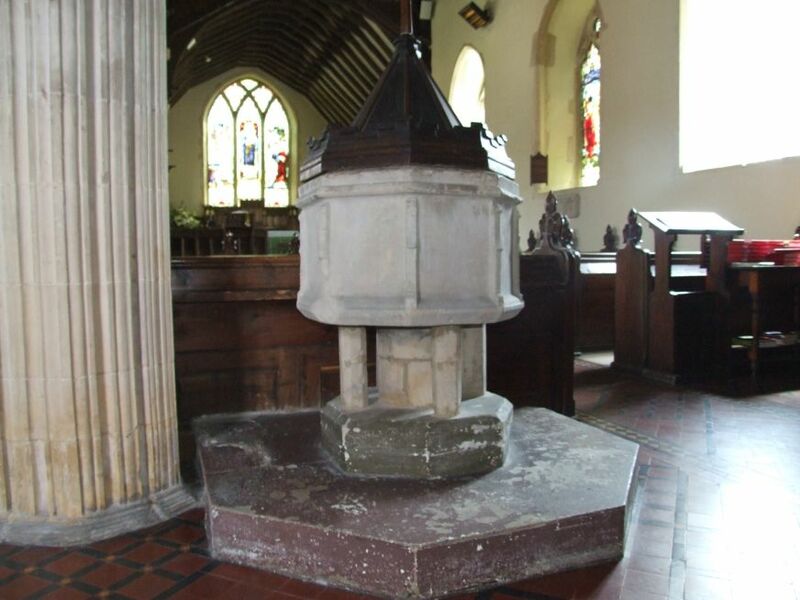 i was also able to tell her that I had since left the same volume behind in two other churches, Gipping and Wingfield, and on both occasions the churchwardens there had done the same thing. St Mary is a lovely church, in a lovely village, and I thought that it must be very pleasant to live here, and worship here.